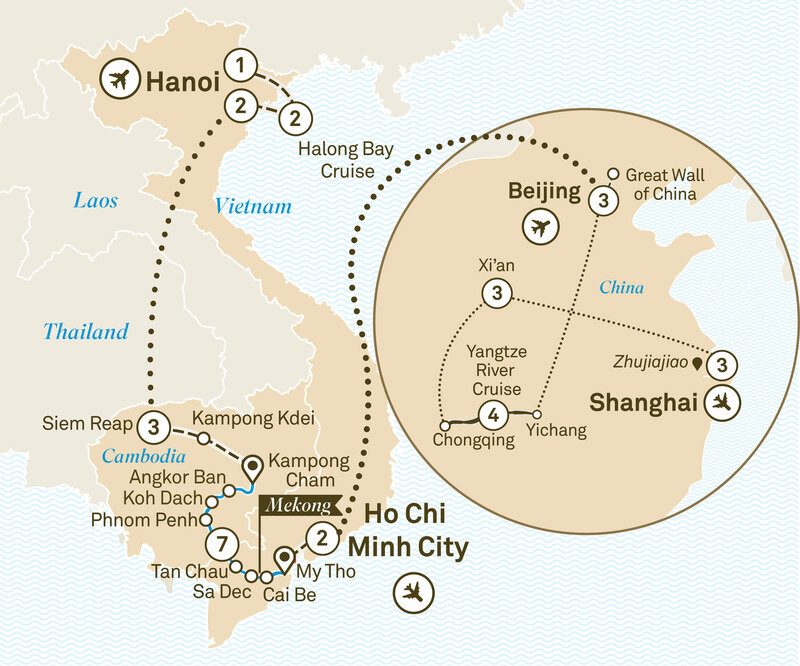 In Vietnam, explore Hanoi and the Red River region through to Halong Bay, cruise along the mighty Mekong River on board the luxurious Scenic Spirit, then discover China's Yangtze River, all in one amazing journey. You’ll travel through three of China’s most prominent cities – Beijing, Shanghai and Xi’an – and discover many of the must-see wonders, from the Great Wall of China to Xi’an’s famous Terracotta Warriors. History, culture, cuisine – it’s all on the table, including an incredible cruise along the majestic Yangtze River. Welcome to Hanoi, the capital of a vibrant Vietnam. Enjoy the day at leisure and settle in for an overnight Special Stay at your iconic hotel. Tonight meet your Scenic Tour Director at your welcome briefing and dinner. After a morning at leisure, fly to Siem Reap for your three night Special Stay. Fly to Beijing, China via Hong Kong for your next adventure. Settle into the luxurious hotel in Beijing, within walking distance of the Silk Markets, for a three night Special Stay. Your wonderful journey starts with a welcome feast of Peking Duck. Wander through Tiananmen Square and enter the Forbidden City. Later, enjoy lunch with a local family in a traditional home before a rickshaw ride through the ancient alleyways. Choose between contemporary Asian dining or modern Western epicurean cuisine. Explore the beauty of the Summer Palace and cruise Kunming Lake before flying to Yichang to join your cruise ship, the Yangzi Explorer. Enjoy dinner on board with included wine and beer. Visit the Three Gorges Dam project site. Later, sail through Xiling Gorge while sampling afternoon tea delights. Tonight enjoy the Captain’s reception. Take an excursion to Fuling and 816 Underground project. Tonight, enjoy the Taste of China gala dinner and dress in your finest Chinese outfit. Disembark and visit Chongqing Zoo where you’ll get to see the rare and treasured giant panda before flying to Xi’an. Later, check into your hotel for a three night stay. Gaze at Emperor Qin Shi Huang’s amazing Terracotta Warriors in the company of a museum curator, an amazing opportunity to learn first-hand about the restoration process. wall on foot, by push bike or electric buggy. Tonight enjoy the wonderful Tang Dynasty Cultural Show with dinner. This morning explore the Muslim Quarter, an integral part of daily life in Xi'an at the eastern end of the Silk Road. Later fly to Shanghai and experience the speed of the Maglev train from the airport before transferred to your luxurious hotel for a three night Special Stay. Discover Shanghai’s stark historical contrasts. Stroll along the famous Bund before comparing its heritage buildings to Yu Gardens. Across the Huangpu River, explore the Pudong area and discover modern China. Admire the view from Shanghai Tower, the tallest building in Pudong. Tonight, enjoy the agility and skill of the renowned Shanghai Acrobats. Wander through the Shanghai Museum and People’s Square before exploring the French Concession Region and Xintiandi entertainment area. Alternatively, visit Zhujiajiao, a town with a rich canal life and a wealth of traditional buildings and bridges. Later, spend your free time exploring Nanjing Road’s shopping opportunities before enjoying your farewell dinner. It’s time to bid farewell and transfer to Shanghai Airport.